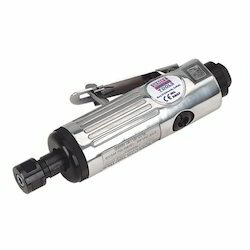 Pneumatic Straight Die Grinder is developed by skilled and trained workforce utilizing high grade raw material and advanced technology. This product is offering at par with the set quality standards. Experts are offering this gamut to customers in both, standard and customized options as per its various specifications. Mini Die Grinder at IMTC is Compact, lightweight design for easy maneuverability. Lock off throttle to prevent accidental start up. It complete with 1/4" and 6mm collet, Built in regulator to match speed to the job having applications in high speed blending, smoothing, porting and deburring in confined areas with Free Speed of 28000 rpm. Free Speed: 20, 000 r.p.m. Our range of Die Grinders is available in compact designs. These die grinders are very sturdy and are fabricated in accordance with the requirements of our clients. They are available in different length, weight and free speed which they offer. This IMC range of product is designed for optimum use in the foundry, ship building, construction industries, die & foundry shops. A high power motor maintains a high speed while under load. The steel housing braves rugged and tough use. These grinders are best used for Die contouring & repairing, cleaning welds, forging dies & casting moulds, etc. For precision engineers’ mould making etc. 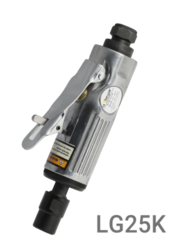 Safety lever throttle, front exhaust, ultra compact and lightweight. Air inlet thread: 1/4 NPT.